Biscuit the pug cakes Churro the pug doggie donuts donuts doughnuts doughnuts or donuts? We recently celebrated the anniversary of Churro's adoption day with puppy doughnuts, new squeaky toys and lots of hugs. We usually try to celebrate in some small way because he's such a joy to us (plus he's an old guy and he totally deserves a party!). You may remember me telling you just how much we love him in this previous post. He certainly has changed our hearts and home for the better! These puppy doughnuts are made with one of Churro's favorite snacks - apples! The batter gets a big helping of unsweet applesauce, and even more apples are diced and folded into the batter. These doughnuts aren't the light-and-fluffy sort, the coarse fruit and veg makes them dense and chunky. He loves his human dad and sleeps beside him every night. He also kicks in his sleep, so his dad is sometimes very tired in the morning. He loves fruit, especially bananas, watermelon, blueberries and apples. He is protective of his kibble. 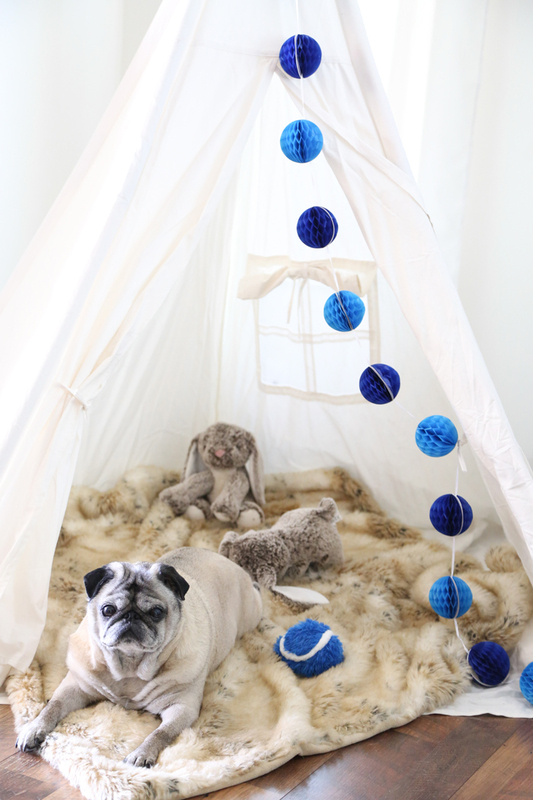 He loves round plush toys (like that blue ball in the picture). He has a soft little old man bark. He bosses his pug brother around when he's in the backyard, but turns into a marshmallow when he comes back inside the house. He has hip dysplasia and can only walk a short distance, so he gets to ride in a stroller when we go to the park. Car rides are his jam! He has cat blindness, which means he lives with two cats but has never seen either of them. 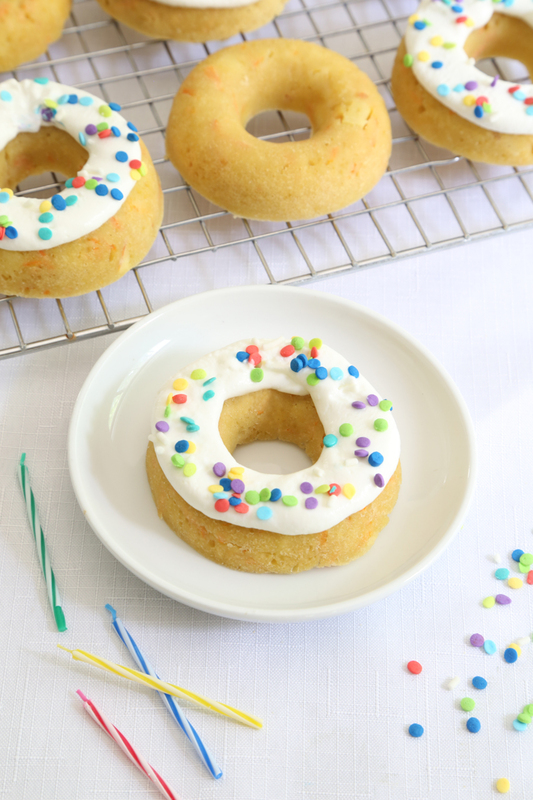 You'll need a standard size doughnut pan to make these. Only baked doughnuts for puppies! I use and recommend this nonstick doughnut pan made by Wilton. I wish you could've heard all the snurrrfling and snorrrfling and heavy breathing going on in the photos above. Churro was VERY into these. Biscuit and Churro on their best behavior because - doughnuts. 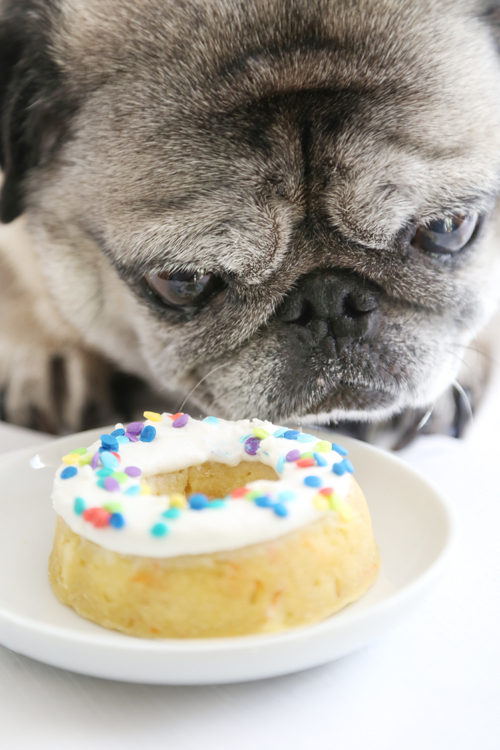 Churro likes to lick the frosting off of the doughnuts before he digs into the cake (I can relate). The frosting isn't sweet at all because it's strained unsweet Greek yogurt. My dogs tolerate dairy just fine, but some dogs get an upset tummy with milk based foods. If you're not sure about your dog, then omit the yogurt frosting. You may instead opt for a shmear of natural peanut butter with no salt and no sugar added. We've now had Churro for six years! I remember when I first posted about him just two days after we adopted him in 2010 (see this post, and scroll to the bottom). We were still trying to settle on a name at the time. A lot has changed since then, and not just the grey on his face. He's learned how to play and how to trust. We taught him that. We've learned about unconditional love. He taught us that. 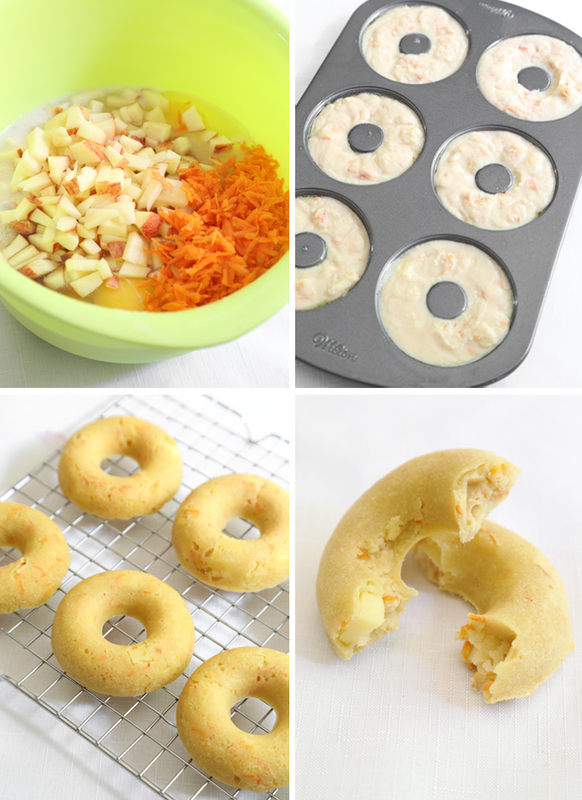 You’ll need a standard-size six cavity nonstick doughnut pan for this recipe (see blog post for sources). I used strained plain Greek yogurt as frosting for these doughnuts, but natural unsweet, unsalted peanut butter can also be used. Remember, you are the health advocate for your dog. If your dog has food allergies or other health complications, ask your vet before introducing new snacks to their diet. Preheat the oven to 350°F. Grease the cavities of a nonstick doughnut pan with coconut oil; set aside. Combine all of the ingredients in a large bowl. Stir together until a thick batter forms. Transfer the batter to a piping bag or a zip-top bag with the corner snipped. Pipe the batter into the doughnut pan cavities to the very top (the batter will not rise much as it bakes). Rap the pan on the counter top to level the batter. Bake for 10 minutes. Let the doughnuts cool in the pan for 5 minutes, and then turn out onto a wire rack to cool completely. Serve cupcakes to delighted pups plain, or frost with strained Greek yogurt or natural peanut butter. Gotta do this for my four hooligan rescue hounds! Wow, four?! That's so awesome. My heart could about burst seeing how much you love your babies! That's because I love my own babies as much as you love yours! Being mom to a pair of Great Danes, I've baked meaty treats and created complex meat terrines to celebrate birthdays! I know how important these events are! 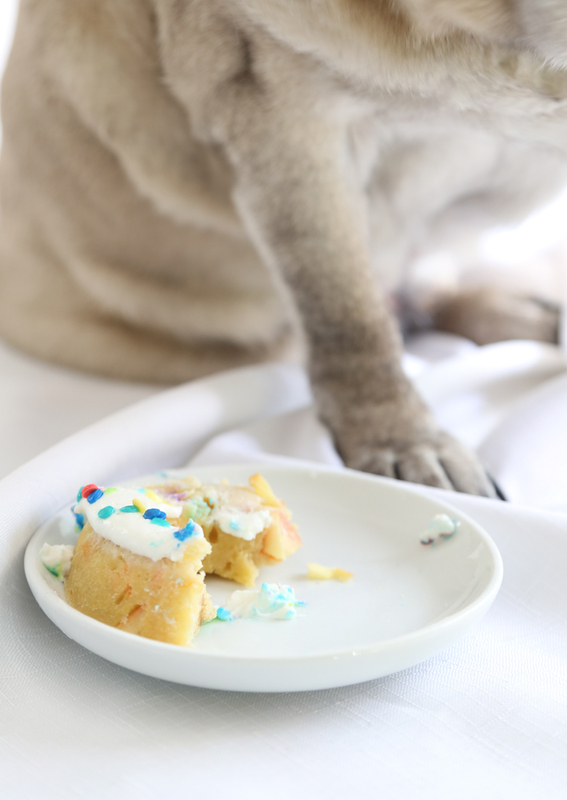 It warms me to see the love and attention you give to your baking, your photography . . .and your deeply loved pups! Thank you for sharing this part of your life with us! Aw, thank you Kimberly. Wow, TWO Great Danes! I just love those gentle giants. I just read the story of Churro and it broke my hear to hear what he went through. You are an amazing human being, you and your husband are for giving him a wonderful life. I enjoy your recipes and I also enjoy reading about your pugs on here as well. 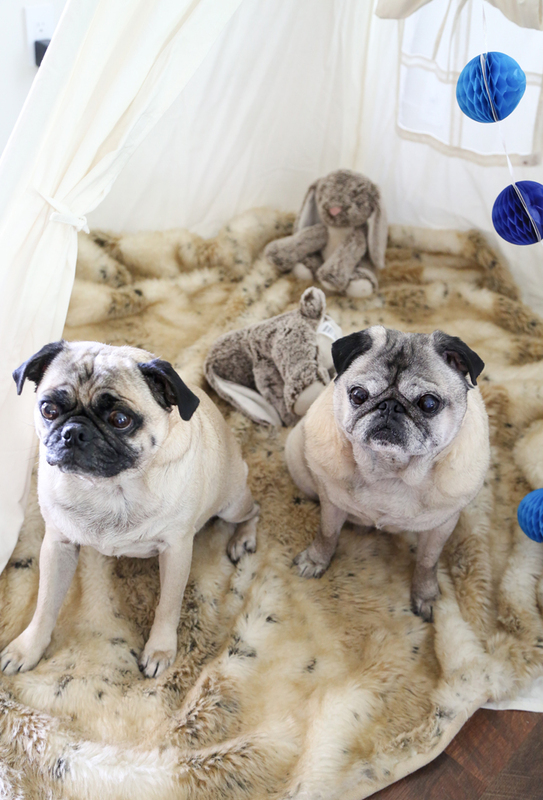 Churro and Biscuit are lucky pugs to have you in their life. 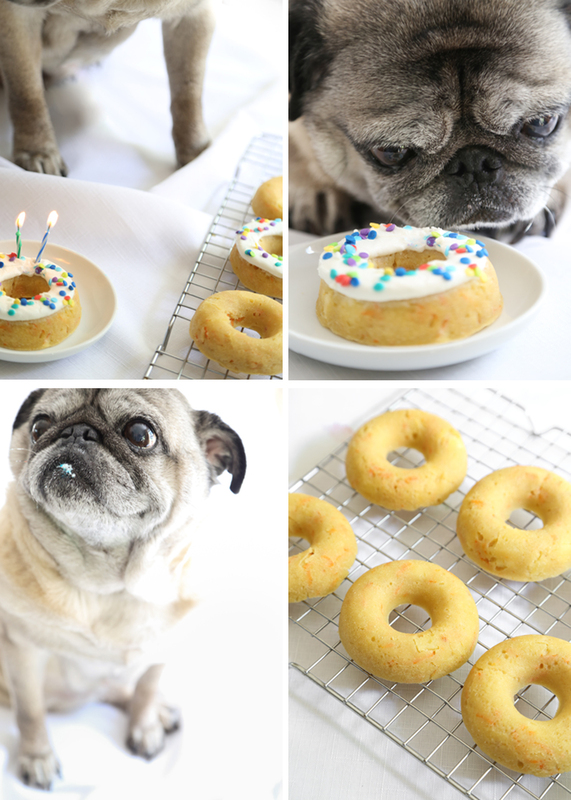 Im excited to make these donuts for my two pugs, Butch and Buffy Jr.
You are so sweet, Rosie. Thank you so much for the kindness. Hugs to Butch and Buffy Jr.! 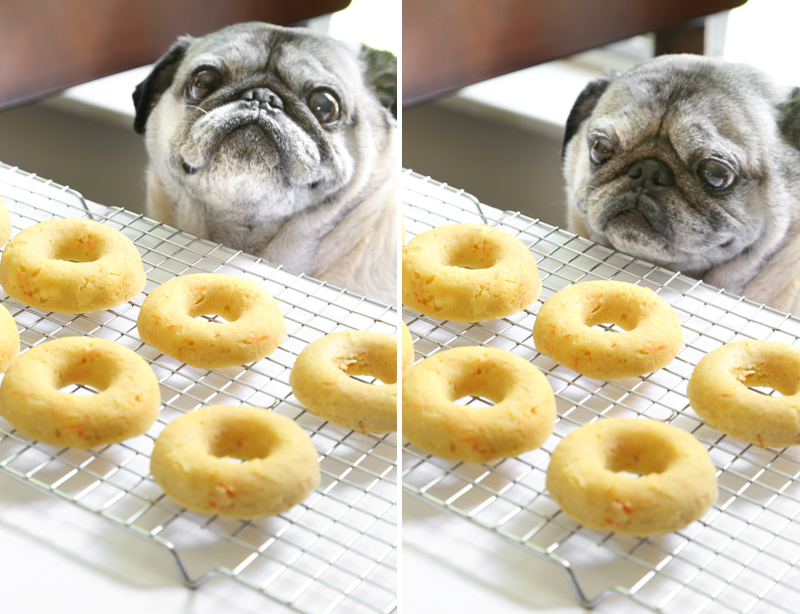 Oh my goodness, that last photo of him eyeing the one on the plate is too perfect! Does it need to be melted coconut oil? How long do theses doughnuts keep for? If you store them under plastic wrap in the refrigerator they'll keep 3-4 days.